The graph above shows a function before and after a vertical dilation. The coordinates of two points on the solid line are shown, as are the coordinates of the two corresponding points on the dashed line, to help you verify that the dashed line is exactly twice as far from the x-axis as the same color point on the solid line. The origin is a point shared by both lines, and it is useful to note that the dashed line is still “twice as far from the x-axis” at the origin, because . 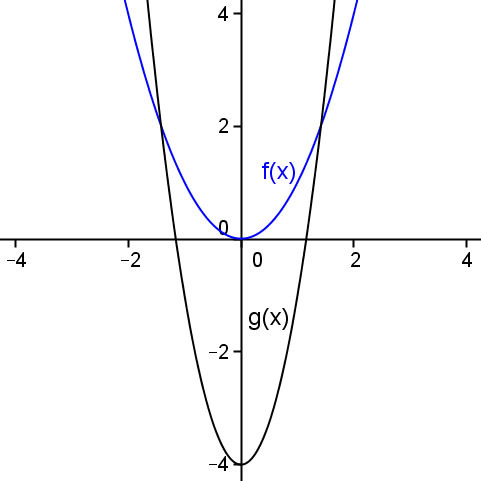 Any point that satisfies a function definition and lies on the x-axis will not move when the function is dilated vertically. the dashed line has been “dilated vertically by a factor of 0.5” to produce the solid line. Both statements describe the graph accurately. However, in general the function definition which is simplest (in algebraic terms) will be considered the “parent” function, with the more complex-looking definition being described as a dilation of the simpler function. f(x) has been dilated vertically by a factor of 3, then translated vertically by +5 and horizontally by +1 to produce g(x). It was then shifted one unit to the right, causing its x-coordinate to change from 0 to 1. So, the “parent” vertex that was at the origin is located at (1, 5) in the transformed function. It was then shifted one unit to the right, just as the vertex was, and that point (3 ,17) satisfies the equation of the dashed parabola, g(x). Visualizing functions as translations and dilations of a simpler “parent function” can make complex-looking equations much easier to interpret. Note that a negative dilation factor causes both a dilation and a reflection about the axis to occur. All points that were on one side of the axis of dilation are reflected to the other side of the axis by a negative dilation factor. By defining g(x) this way, we are explicitly stating that every y-coordinate produced by g(x) will be three times the corresponding y-coordinate on f(x). In other words, g(x) is f(x) dilated vertically by a factor of three. f(x) passes through the point (2,8). Since we are examining vertical dilations, let’s keep the x-coordinate the same and ask “What will g(2) be?” The original f(x) will be stretched vertically by a factor of three vertically everywhere, including at x=2, so (2,8) becomes (2,24). You can verify for yourself that (2,24) satisfies the above equation for g(x). This process works for any function. dilates f(x) vertically by a factor of “a”. The original vertical translation and y-intercept of +1 ( the constant term in the definition of f(x) ) is also affected by the vertical dilation, and becomes +3 in g(x)… three times the distance from the x-axis that it was originally. Since (3,13) moved to (1,13), multiplying every “x” in f(x) by 3 has compressed the graph horizontally, with each point being moved to one third of its previous distance from the y-axis. If multiplying the result of a function by a factor causes a vertical dilation by the same factor, why does multiplying the input variable by a factor cause a horizontal dilation by the reciprocal of that factor? To ask the question another way, if using a coefficient greater than one expands things vertically, why does it shrink things horizontally? This difference in effect seems counter-intuitive at first glance. The difference occurs because vertical dilations occur when we scale the output of a function, whereas horizontal dilations occur when we scale the input of a function. The “x” in the original f(x) became a “3x” in g(x), so g(x) reaches a given “input value” three times faster than f(x). “x” only has to be 1/3 as big in g(x) for the result of the equation to be the same as f(x). Therefore, all points on g(x) have been scaled to be 1/3 of the distance from the vertical axis that they were in f(x). represents a horizontal dilation of the parent function by a factor of “1/a”. for the new equation to represent a horizontal dilation of the parent by a factor of 2. 1) Dilated horizontally by a factor of 1/6, then translated horizontally by +2. No vertical dilation. 2) Dilated horizontally by a factor of 1/3, then translated horizontally by +2. Dilated vertically by a factor of 4. 3) No horizontal dilation, translated horizontally by +2. Dilated vertically by a factor of 36. Note how the horizontal translations change as the horizontal dilations change. Since a horizontal dilation shrinks the entire graph towards the vertical axis, the graph’s horizontal translation shrinks by the same factor. As the original horizontal dilation factor of 1/6 in the example above is increased by a factor of 6 to be 1 (becoming converted into a vertical dilation factor of 36 in the process), the original horizontal translation of 12 shrinks by a factor of 6 to become 2.
which tells us that the “parent function” has been translated horizontally by +2 after all dilations have been carried out. If you graph both f(x) and g(x) on the same graph, as shown above, you will note that the two graphs intersect one another at the line y=2, which is the line about which we dilated f(x). Those are the only two points on the graph of f(x) that remain unchanged by the dilation. This same process can be followed to create horizontal dilations about some vertical line: translate the function horizontally, then dilate it, then translate the result back to where it started. Thanks for this nice post. Can you please provide a reference (book/published paper) for the formal definition of ‘Function Dilation’? Although in ordinary English, a dilation is a stretching, widening, or enlarging (when the doctor puts drops in your eyes to dilate them, your pupils get very large), in math, dilation is used for both stretching and shrinking. A better word might be “scaling,” since that carries the idea of both increasing and decreasing without having to specify which (we both “scale up” and “scale down”). I am not sure why you want a formal definition, but I suspect that if you search online math sources for “scaling” you’ll find what you want. In most functions, including polynomials, trig functions, exponential functions, etc., a coefficient that multiplies the output of a parent function after the input is mapped to some output depending on the function rule will have the effect of scaling (enlarging or shrinking, and possibly “flipping” around the x-axis if the sign of the coefficient is negative). Some texts do not use the word dilation, choosing instead to use phrases such as “Stretching or Shrinking”, or “Stretching or Compressing”, or “Scale Change”. References to three texts on my bookshelf are below. Two use the word “dilation”, and one does not. The remaining texts I have do not use the word “dilation”, but instead using “stretching”, “shrinking”, or “compressing”. I have also include some links to definitions on the internet at the end, several of which have slightly differing definitions than the one I have used in this post. My local school district has been using “dilation” as their preferred term for a decade or so. “Advanced Mathematical Concepts – Precalculus with Applications” published by McGraw Hill/Glencoe in 2007 (ISBN 0-07-868227-4) refers to dilations in a number of places starting on pg 88 and later, but really only defines the term in its Glossary on pg A73 “a transformation in which a figure is enlarged or reduced”. “Elementary Linear Algebra” by Howard Anton, published by John Wiley & Sons in 1973 (ISBN 0-471-03247-6) describes a dilation on pg 186 as a transformation that “stretches each vector … by a factor of k”. This text uses the term “contraction” when a dilation factor between 0 and 1 is used, vs dilation when the factor is greater than 1. “Functions, Statistics, and Trigonometry” by UCSMP, published by Scott Foresman Addison Wesley in 1998 (ISBN 0-673-45926-8) defines “scale change (in the plane)” on pg 921 as “The transformation that maps (x, y) to (ax, by), where a <>0 and b<>0 are constants”. I think from the explanation given for the original equation “g(x)=3(x-1)^2+5”, it should read “g(x)=3(x+1)^2+5” for there to be a +1 vertical translation.